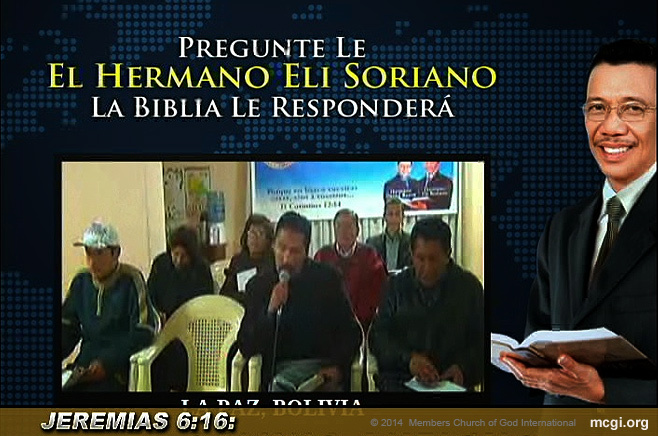 Attendees of a Bible Exposition in La Paz, Bolivia ask Bro. Eliseo Soriano their question of faith via live video streaming. Pampanga, Philippines – El Salvador and Guatemala become the latest Latin American countries to be reached by the El Camino Antiguo (The Old Path) broadcast. El Camino Antiguo, The Old Path’s Spanish version, launched its 24-hour-a-day national television broadcast via Canal 61 on January 15, 2014. The program made its debut on Guatemalan television on February 1, 2014. Guatemalans can watch El Camino Antiguo from 11:30 PM to 12:30 AM on weekdays, and 8 AM to 9 AM on weekends. On May 13, 2013, The Old Path’s Spanish version aired via Canal 9 in Costa Rica. Hondurans on the other hand were able to tune in to the program a year earlier via Canal 7. Bolivia saw El Camino Antiguo in 2011, while Portugal watched O Caminho Antigo the same year. The flagship program of the Members Church of God International (MCGI) The Old Path or locally known as Ang Dating Daan, started in the Philippines in 1980. Hosted by MCGI Leaders Bro. Eliseo Soriano and Bro. Daniel Razon, Ang Dating Daan remains as the country’s longest-running religious program. Today, it can be watched in six of the seven continents via free, cable and satellite TV, and the Internet. To view The Old Path’s list of programs worldwide, please see here.